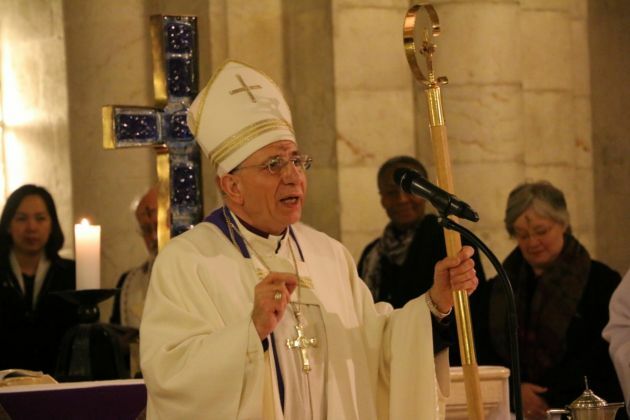 Palestinian Bishop Munib A. Younan, the president of the 74-million strong Lutheran World Federation is to receive the prestigious 2017 Niwano Peace Prize for his work in encouraging interreligious dialogue in the Middle East. "In a world characterized by leaders who seek to emphasize difference and hatred, Bishop Younan has consistently strived for the opposite," said the Niwano Foundation. The award is often seen as akin to a Nobel Peace Prize for members of the faith community. It is awarded by the Niwano Peace Foundation and come with a prize of 20 million yen (US$177,000). "I come to the table of dialogue with different religious leaders from the three faiths," Bishop Younan said, after the prize was announced. "I come with the suffering of my people under my skin. I come to speak on the future of the people who are living in this land. "Religious leaders have a responsibility. Peace and dignity will come with how we educate and how we dialogue and we can reflect this to the politicians." The prize is a "strong affirmation to continue upholding peace as necessary and possible, and an encouragement not to be derailed from peace-building in a conflicted and suffering world," LWF general secretary Martin Junge said. The foundation noted that Younan was born to Palestinian refugees into a world where nation, religion, and place are intimately connected with identity. "The ongoing conflict between Israelis and Palestinians has been a prime example of the break down in communication between people whose differences appear to outweigh their similarities," said the Niwano Foundation. "The conflict between people of the three dominant religious identities has consistently been forcing Muslims, Jews, and Christians further apart, to a point where violence appears to be the only mode of retaliation. "Despite these complex challenges, Bishop Younan has worked with dedication to foster conversation between Jews, Christians, and Muslims in Jerusalem and beyond. Younan has Bishop of the Evangelical Lutheran Church in Jordan and the Holy Land since 1998 and became LWF president in 2010. The Niwano Peace Foundation says it established the Niwano Peace Prize to honor and encourage individuals and organizations that have contributed significantly to interreligious cooperation. It aims thereby to further the cause of world peace, and to make their achievements known as widely as possible. The presentation ceremony will take place in Tokyo, Japan, on July 27.